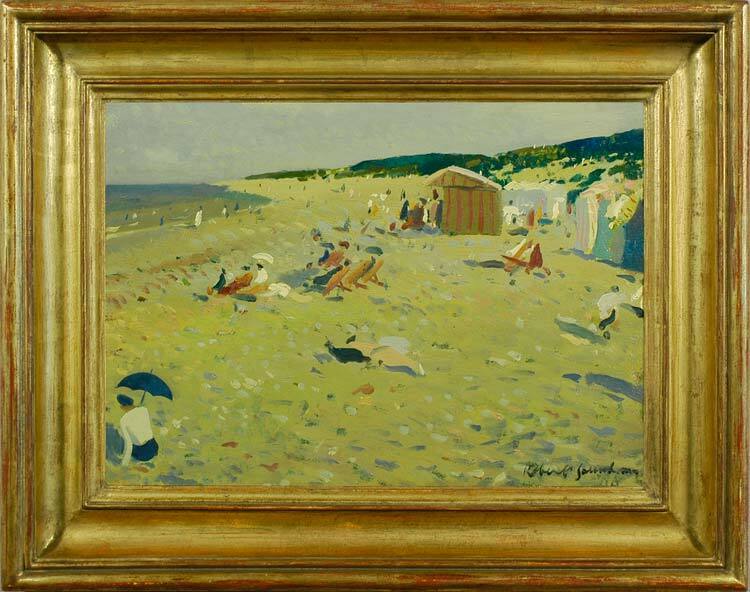 One of Greenham’s plein air seaside paintings, probably painted on one of the shingly Suffolk beaches with their low dunes, this shows the English at play in the quiet decades after the war, recalling similar scenes by Bonington and Monet on the Normandy beaches. The light is softer and the North Sea more green and grey than in the Impressionists’ works, investing this serene, sunny seaside, its kiosks, windbrakes and deckchairs, with a sense of utter calm. The composition is influenced by Degas: truncated figures at the edges emphasize the spontaneity of the scene, aided by the wide areas of open space; whilst the broken brushwork recalls Philip Wilson Steer’s paintings of Walberswick beach.